Eggs are no longer just a breakfast food when transformed in this health-boosting dish. Earthy turmeric and smoky cumin are toasted with farro and a fresh fried egg, creating a quick yet hearty dish that is perfect for lunch or even dinner. Heat the oil in a small skillet over medium heat. Toast the turmeric, cumin and cayenne (if using) in the hot oil for about 30-60 seconds, until aromatic. Add the farro and sauté until it is heated through, about 2 minutes. Clear a space in the center of your pan, pushing the farro out to the edges. Let the oil and spices seep back into the center then carefully crack the egg into the space. When the egg has set enough to be easily flipped, flip it over using a spatula. The bottom will be a deep red-orange hue. Cook until the egg is set to your liking. Also, we prefer to leave the yolk slightly runny. 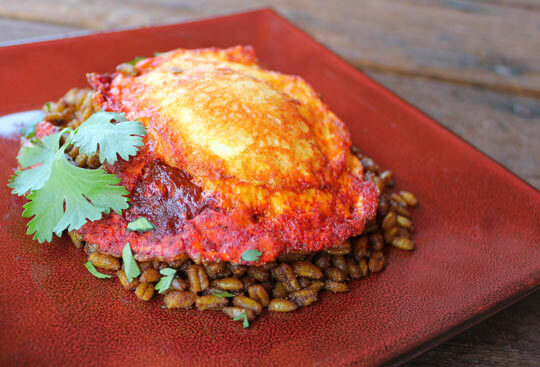 The flavor and texture of the warm yolk combined with the toasted farro is divine. The black pepper in this recipe is crucial. If you aren’t fond of the flavor, try to add at least a tiny pinch. Black pepper increases the bioavailability of turmeric, unleashing a wide array of health benefits. The oil (fat) also plays a role. Serve the egg over the farro. Garnish with fresh cilantro or chopped green onions and a dab of hot sauce. Enjoy!